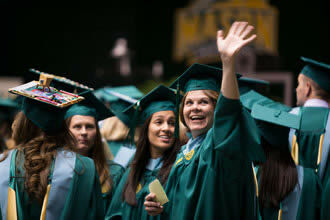 Contact Elementary Education at elemed@gmu.edu. An Advisor will answer any questions that you may have about your program or degree. Professional Development Schools (PDSs) are innovative institutions formed through partnerships between education programs and P-12 schools. "Traditional" model of teacher preparation: The internship is thought of like a one-way street where the intern is the focus of learning—the only person constructing knowledge. And where the school and university are separate entities. PDS model of teacher preparation looks more like this, with enhanced student learning being everyone's ultimate goal. Student learning in this model is a shared enterprise. Please refer to Student Clinical Practice: Field Experiences & Internships for information on Handbooks, New Student Handbooks, Internship Applications, Internship Manuals, and Internship Form Guidebooks. Students in a graduate program must maintain a 3.000 GPA (B average). Endorsement course work grades must be C or better for undergraduate courses and B or better for graduate courses. Grades of B or better are required for all graduate-level education course work for licensure.